Implements: Two flexible silicone half-sphere molds (Half-Sphere .68 oz, 1.57 inch dia. x .79 inch deep, 15 cavities), a little spray cooking oil or vegetable oil, and paper towels. Prepare the molds by wiping the mold cavities with a paper towel moistened with a a little vegetable oil (or a quick spray of unflavored cooking oil spray will also work). Then, wipe the mold cavities with a clean paper towel. This will leave just the slightest residue, which will help unmold the gelatin without affecting the taste or appearance. Place each mold on a cookie sheet or cooling rack to provide a stable surface. Prepare cherries. Cut the very bottom end off each cherry. (This will allow the cherries to stand up straight in the molds.) Place the cut cherries on a paper towel to drain. Prepare Opaque Layer. Place juice in a saucepan and sprinkle with the gelatin. Allow to soak for a minute or two. Heat over very low heat, stirring constantly, until dissolved (approximately 5 minutes). Remove from heat. Fill each mold cavity 1/3 full with the gelatin mixture. Refrigerate until fully set, 30 minutes to an hour. Meanwhile, prepare the Clear Layer. Place juice in a saucepan and sprinkle with the gelatin. Allow to soak for a minute or two. Heat over very low heat, stirring constantly, until dissolved (approximately 5 minutes). Remove from heat and set aside to cool slightly (about 15 minutes). When the mixture has cooled, and the Opaque Layer is set, remove the molds from the refrigerator. Place a cherry, cut side down, in each mold cavity. Using a tablespoon, carefully fill each mold cavity to the top with the reserved clear gelatin mixture. Return molds to the refrigerator, and chill for several hours (ideally overnight to allow the layers to fully bond). To serve, unmold. Immediately before serving, garnish with the cake sprinkles, if desired. When serving jelly shots at a party where both adults and kids will be in attendance, I definitely like to provide a kid-friendly gelatin option along with the full-octane adult variety. My recipe for Rainbow Cherry Jigglers was inspired by these wonderful rainbow-hued maraschino cherries found at a local grocery (Roland Cherries can also be ordered online). Designed for children, yes . . . but surprisingly appealing to adults as well! When this recipe first appeared on the Jelly Shot Test Kitchen blog earlier this year, I received a flood of comments and emails asking how to make a “Big Boy” version of the Rainbow Cherry Jiggler. Easy peasy - just swap out 1/3 to 1/2 of the juice called for in each layer and replace with your favorite clear alcohol (a flavored vodka or rum would be great!). Instructions for preparing a spiked version vary only minimally - for each layer, dissolve the gelatin in the juice, remove from heat, stir in the alcohol, and proceed per the instructions. 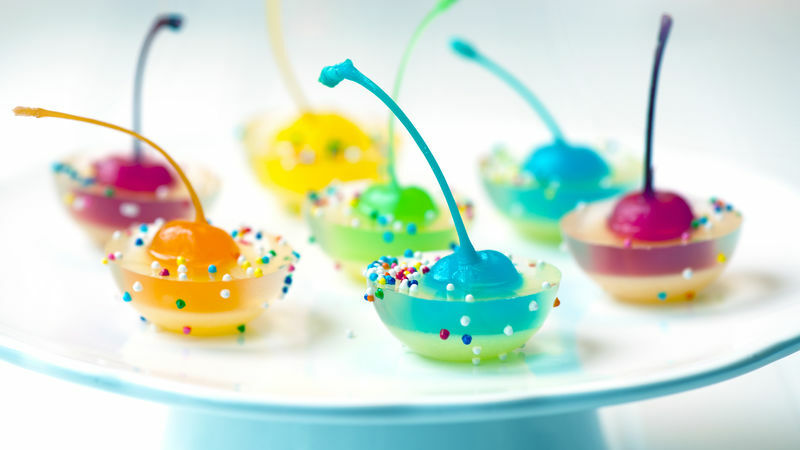 The flexible silicone half-sphere molds used to set the jelly shots were purchased from Kerekes. The jelly shots could also be set in a 9”x9” square cake pan, with cherries spaced at regular intervals, then cut into desired shapes with a knife. Important serving tip: the cake sprinkles are a very cute garnish, however for best results be sure to add them at the very last moment. “Spiked” or “virgin”, I hope Rainbow Cherry Jigglers prove to be a fun addition to your bag of party tricks!